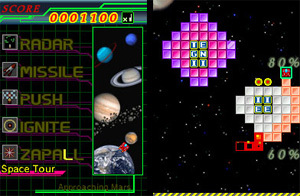 An expanded version of the "Square" game in Maboshi's Arcade. Take control of the Flametail incinerator pod as it flies through the galaxy leaving a trail of block-busting flames behind it. Destroy all the blocks before they cross the hazard line. Use power-ups to assist your progress. In Space Tour you clear stages as you travel to different planets, with the difficulty ramping up. In Time Limit mode, you have to clear as many blocks as you can within three minutes.